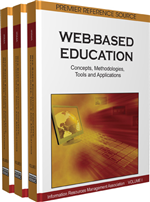 This chapter surveys the benefits and challenges of hybridcourses, which blend face-to-face instruction with onlinelearning, and opportunities provided by the introduction of web-based social interaction technologies. It discusses thepedagogical implications of various Web 2.0 tools; that is, asynchronous discussion boards, blogs, wikis, podcasts, RSS, e-portfolios, folksonomies, educational gaming, data mashups, and simulations. The authors argue that ashybrid courses continue to evolve to meet the needs of students, instructors, and institutions of higher learning,the integration of Web 2.0 applications in a hybrid model requires thoughtful course design, clear educational objectives, and carefully planned activities.